در این پژوهش به بررسی تاثیر اندازه و نوع ساختار نانوذرات سیلیکا بر مورفولوژی ساختاری نمونه‌های اسفنج منعطف پلی‌یورتان و همچنین به بررسی رفتار کششی آن‌ها پرداخته شد. بدین منظور نانوذرات سیلیکا با دو ساختار مختلف توپر و توخالی و میانگین اندازه‌ ذرات 40 nm و 150 nm تهیه گشتند و به عنوان فاز تقویت‌کننده در زمینه اسفنج منعطف پلی‌یورتان با درصدهای وزنی مشابه 0.1،0.2 و 0.3 پخش گردیدند و نمونه‌های نانوکامپوزیتی ساخته شدند. در ادامه به مقایسه و بررسی ساختار این دو گروه از نانوکامپوزیت‌ها با یکدیگر و نمونه خالص توسط میکروسکوپ الکترونی روبشی (SEM) پرداخته شد و تاثیر ساختار نمونه بر رفتار کششی آن‌ها بررسی شد. نتایج حاصل از SEM نشان می‌داد که در درصدهای وزنی مشابه از فاز تقویت‌کننده، اندازه و تعداد سلول‌های تشکیل شده در نانوکامپوزیت‌ پلی‌یورتان- نانوذرات توپر سیلیکا نسبت به نانوکامپوزیت پلی‌یورتان- نانوذرات توخالی سیلیکا و نمونه پلی‌یورتان خالص بیشتر می‌باشد. همچنین نتایج آزمون کشش نشان داد که با افزایش درصد وزنی فاز تقویت‌کننده در زمینه اسفنج پلی‌یورتان، استحکام کششی نسبت به نمونه خالص بهبود و درصد ازدیاد طول کاهش پیدا کرده است. بعلاوه افزایش خواص کششی با تعداد و اندازه سلول‌های شکل گرفته رابطه مستقیمی دارد. به طوری‌که نانوکامپوزیت‌های تقویت‌شده با نانوذرات توپر و نانوذرات توخالی سیلیکا در 0.3% وزنی، استحکام کششی به ترتیب حدود %78 و %34 افزایش و درصد ازیاد طول نیز به ترتیب حدود 44% و 30% نسبت به نمونه خالص کاهش پیدا کرد. 2Department of the materials engineering, Shiraz University, Shiraz, Iran. In this research, the effect of size and type of silica nanoparticle structure on the morphology and tensile behavior of flexible polyurethane foams were investigated. For this purpose, silica nanoparticles were prepared with two structures rigid and hollow with average particle size of 40 and 100 nm respectively, and reinforcement phases were dispersed in the matrix of flexible polyurethane foam with weight percentages of 0.1, 0.2 and 0.3. Then, comparison and investigation of nanocomposite and pure samples were studied by scanning electron microscopy (SEM) and the effect of structure on the tensile behavior examined. The results of the SEM shown that among all of the samples, polyurethane/rigid silica nanocomposites have more than the size and number of cells. Also, the results of the tensile test shown that by increasing weight percentage of the reinforcement phase in the matrix, the tensile strength were increased and elongation at break were decreased. The addition, there was direct relationship with tensile properties and size and number of cells. So that, the nanocomposite reinforced with rigid and hollow silica nanoparticles at 0.3% wt, increased tensile strength by 78% and 34%, and decrease the elongation at break by 44% and 30%, respectively, relative to the pure sample. Chen, Z. Xu, C. Ma, C. Ren, W. and Cheng, H. M., "Lightweight and Flexible Graphene Foam Composites for High‐Performance Electromagnetic Interference Shielding," Advanced materials, Vol. 25, No. 9, pp. 1296-1300, 2013. Gupta, N. Pinisetty, D. and Shunmugasamy,V. C., Reinforced Polymer Matrix Syntactic Foams: Effect of Nano and Micro-Scale Reinforcement. Springer Science & Business Media, 2013. Kango, S. Kalia, S. Celli, A. Njuguna, J. Habibi, Y. and Kumar, R., "Surface Modification of Inorganic Nanoparticles for Development of Organic–Inorganic Nanocomposites a Review," Progress in Polymer Science, Vol. 38, No. 8, pp. 1232-1261, 2013. Goren, K. Chen, L. Schadler, L. S. and Ozisik, R., "Influence of Nanoparticle surface chemistry and size on supercritical carbon dioxide processed nanocomposite foam morphology," The Journal of Supercritical Fluids, Vol. 51, No. 3, pp. 420-427, 2010. 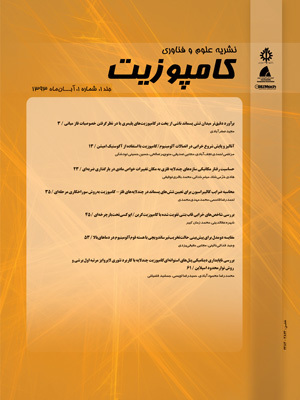 Khosravi, H. and Eslami-Farsani, R., “An experimental investigation into the effect of surface-modified silica nanoparticles on the mechanical behavior of E-glass/epoxy grid composite panels under transverse loading”, In Persian, Journal of Science and Technology of Composites, Vol. 3, No. 1, pp. 11-20, 2016. Sedghi, A. Eslami Farsani, R. and Shokuhfar, A., “The Effect of Commercial Polyacrylonitrile Fibers Characterizations on the Produced Carbon Fibers Properties,” Journal of Materials Processing Technology, Vol. 198, No. 1-3, pp. 60-67, 2008. Akherati.S.F, S. R. Mortezaei, M. and Amiri Amraei, I., The Effect of Curing Temperature on Fracture Energy of Nanosilica Filled Epoxy with Different Particle Sizes, In Persian, Journal of Science and Technology of Composites, Vol. 3, No. 4, pp. 389-396, 2017. Abasi, R. Heidary, H. and Pol, M. H., “Experimental Investigation of Carbon Nanotube Addition on Delamination Induced Drilling of Glass-Epoxy Composites”, In Persian, Journal of Science and GTechnology of Composites, Vol. 3, No. 3, pp. 225-232, 2016. Zhang, M. Q. Rong, M. Z. Zhang, H. B. and Friedrich, K., "Mechanical Properties of Low Nano‐Silica Filled High Density Polyethylene Composites," Polymer Engineering & Science, Vol. 43, No. 2, pp. 490-500, 2003. Chen, Y. S. Zhou, Yang, H. and Wu, L., "Structure and Properties of Polyurethane/Nanosilica Composites," Journal of applied polymer science, Vol. 95, No. 5, pp. 1032-1039, 2005. Saha, M. C., Kabir, M. E., & Jeelani, S." Enhancement in Thermal and Mechanical Properties of Polyurethane Foam Infused with Nanoparticles." Materials Science and Engineering: A, Vol. 479, No. 1, pp. 213-222, 2008. Rahaman, M.S. Ismail, A.F. and Mustafa A., “A Review of Heat Treatment on Polyacrylonitrile Fiber,” Polymer Degradation and Stability,Vol. 92, No. 8, pp. 1421-1432, 2007. Sun, Z., Lu, C., Fan, J., & Yuan, F. "Porous silica ceramics with closedcell structure prepared by inactive hollow spheres for heat insulation," Journal of Alloys and Compounds, Vol. 662, pp. 157-164, 2016. L. Feng, Experimental Study of Nucleation in Polystyrene/Carbon Dioxide System. The Ohio State University, 2012. Edoga M. and Egila, E., "Development and characterization of flexible polyurethane foam: part I–physicochemical and mechanochemical properties," J. Eng. Applied Sci, Vol. 3, No. 8, pp. 647-650, 2008. ACCOUNTANCY, B. O., "Iregulatory AGENCY ACTION," The California Regulatory Law Reporter, Vol. 4, No. 2, 1984. Cao, X. Lee, L. J. Widya, T. and Macosko, C., "Polyurethane/Clay Nanocomposites Foams: Processing, Structure and Properties," Polymer, Vol. 46, No. 3, pp. 775-783, 2005. Sung C. H. et al., "Sound Damping of a Polyurethane Foam Nanocomposite," Macromolecular research, Vol. 15, No. 5, pp. 443-448, 2007. Gayathri, R. Vasanthakumari, R. and Padmanabhan, C., "Sound Absorption,Thermal and Mechanical Behavior of Polyurethane Foam Modified with Nano Silica, Nano Clay and Crumb Rubber Fillers," Int J Sci Eng Res, Vol. 4, pp. 301-308, 2013. Montazeri, A. and Naghdabadi, R., “Investigation of the Interphase Effects on the Mechanical Behavior of Carbon 61–367, 2010. NIGJEH, M. TEHRANI, Z. M. HAGHSHENAS, M. and SHAKHESI, S., "Polyurethane Rigid Foam/Organically Modified Nano Silica Composites," in The NANOCON Conference Proceedings, 2009. Shadlou, S. Ahmadi-Moghadam, B. and Taheri, F., “The Effect of Strain-Rate on The Tensile and Compressive Behavior of Graphene Reinforced Epoxy/Nanocomposites”, Materials and Design, Vol. 59, pp. 439–447, 2014. Ebrahimnezhad Khaljiri, H. Eslami Farsani, R. khorsand, H. and Abbas Banaie, K., “Hybridization Effect of Fibers Reinforcement on Tensile Properties of Epoxy Composites” Journal of Science and Technology of Composite, Vol. 1, No. 2, pp. 21-28, 2015. Sasidharan, M. Liu, D. Gunawardhana, N. Yoshio, M. and Nakashima, K., "Synthesis, Characterization and Application for Lithium-Ion Rechargeable Batteries of Hollow Silica Nanospheres," Journal of Materials Chemistry, Vol. 21, No. 36, pp. 13881-13888, 2011.